Capsule Summary: It’s an eventful night at the 4077th with freezing temperatures, shelling, Klinger being shot, Frank hunting for love letters, and B.J. worrying about a patient. There’s not a lot to say about this episode. It’s pretty low-key despite a lot going on. Perhaps the most interesting thing about “It Happened One Night” is how so much is left unresolved. Some of the plot lines are wrapped up: the shelling finally stops and B.J. is able to save Edwards after another round of surgery. But we never find out why Abbott doesn’t want anyone to touch him or what makes him react so angrily. Clearly, we’re supposed to infer that he’s suffering from PTSD. We don’t know exactly how Frank is able to talk his way out of destroying Margaret’s tent but we know she forgives him. Also, we don’t learn if Klinger gets a Purple Heart for his minor gunshot wound. And that wounded Chinese soldier with 13 broken bones is mentioned once and never shows up again. Frank taking apart Margaret’s tent piece by piece is amusing to watch, particularly when he opens the cupboard and finds her riding crop, exercise equipment, and knife. On the other hand, Hawkeye’s can of 1943 beans exploding and covering him and Margaret is cheesy and unbelievable. If the can was hot enough to explode, the beans themselves should presumably be hot enough to hurt, right? Frank couldn’t find a pencil. Margaret’s tent must be very warm. She’s able to fall asleep while reading with only a single blanket. Hawkeye needs a blanket, a heavy coat, and his regular uniform to stay warm. Maybe the wooden slats provide adequate insulation. B.J. was apparently either on duty or keeping a watchful eye on Edwards while Hawkeye was sleeping. Both are up from midnight to dawn. When exactly does B.J. get some sleep? A better question is when does Radar get to sleep? Colonel Potter is asleep in his tent but Radar is scouring the camp at midnight waking people up. This is a really interesting episode – I think it’s one of the very few that takes place almost exclusively at night, so that gives it something different to work with. Abbott was annoying, though. Now that you mention, you’re right, we don’t know why he’s acting the way he is, between mouthing off at the hospital staff, to crying like a baby during the shelling, so maybe you’re right, maybe it’s PTSD (which apparently is a myth). B.J. went to sleep when Hawkeye took over Post-Op for Frank, but Edwards’s condition was apparently enough to keep him awake. 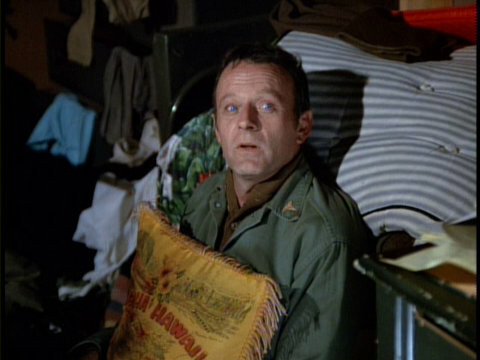 This is one of the rare times M*A*S*H used a different audience reaction in the laugh track: when we see from Margaret’s POV the thorough job Frank did tearing up his tent, we hear an, “Ohhhhhh.” That particular “ohhhhhh” made rounds in the mid-70s, it was heard almost every episode of SIGMUND AND THE SEA MONSTERS, but it dates back farther than that: it’s heard on a couple of early HOGAN’S HEROES episodes, and even as far back as LEAVE IT TO BEAVER. I think the term for what Abbott was going through was shell shock. PTSD , if I’m correct, wasn’t widely known until much later. I wondered why radar covers the window and door window when going into the swamp at the beginning of the episode? The exploding beans is cut from syndication on WGN. They cut a lot of good scenes, while leaving many unimportant/uneventful scenes in. On all the episodes. Editorial staff must not be MASH fans. at Daniel: Radar covers the windows because the PA announcer had just said, “Due to enemy shelling, we will observe blackout conditions effective immediately”. In the background you can see other tent windows being covered throughout the camp. It’s a well done bit of detail. Frank’s ransacking of Margaret’s tent was definitely a sign that his cheese was starting to slide off of his cracker. I find it hard to believe that Margaret would forgive him for it, but it’s a funny sequence. Radar has a brief flashback to the season 1 version of himself when he sniffs Margaret’s laundry and stands over her for a moment before waking her. More proof that Klinger was a good person: Even though he tries to over-exaggerate the severity of his wound, then runs around in the cold in only his underwear, when blood is needed, Klinger quickly volunteers himself. He even helps move the patient. 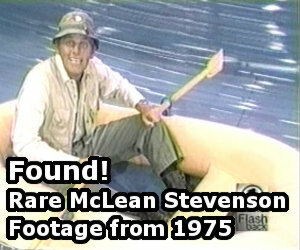 I remember once when my Mom was watching reruns out of sequence (probably when CBS was airing them in the afternoons.) she first thought the curly haired soldier in bed was supposed to be Trapper John. I guess in retrospect we know how empty Hawk’s threat to put a mouse in Radar’s milk was after we learn in “Dr Winchester and Mr. Hyde” that he is terrified of mice. This is an episode I hadn’t seen before last night. Other commenters have noted how Season 4 “goes dark” in subject matter (while also noting S.5 goes the other way, with Frank’s character post-Margaret particularly descending into one-note farce). This ep. literally “goes dark”. It surprised me how low-key and “dramedy” this is – Abbott shouting, making threats, etc. On first impression, it’s not among my favourites, and there are some very good episodes in this run.